Our 2015 CMDA Northeast Winter Conference Group! Recently, we’ve been sending out monthly updates through MailChimp so that our support team can save a click or two. In retrospect, though, I’m realizing that not using our website might make it seem like we’re not up to anything. This would be – in the words of The Office character Dwight Schrute – ‘false’. We may send out future updates in both places (here and MailChimp) to give you the best of both worlds. Here, then, are some recent happenings since our last update in December. One of my (Bryan) passions is raising up men who are difference-makers. Men who will change the world for Christ and make a mark for him wherever they go. To that end, in early January we held our annual men’s night at ‘The Shabazz’, a home where 6 guys training for healthcare are living together. (Although it sounds like a hookah bar, the home takes it name from Shabazz Napier, one of the guys’ favorite basketball players). As the New Year rolled around, our topic was how to make – and actually follow through on – goals that change us and the world around us for Christ. Toward the end of our time, I walked the guys through exactly how to do it and gave them the chance to set a goal right there. Not to mention all the wings we consumed and fun we had. One of the guys even suggested having another before this one finished. The very next evening, Dr Marcie Macolino joined Sharon in hosting our annual women’s night. The topic – how to balance life in healthcare with the rest of life – is always one at the forefront of everyone’s mind. Although an exhaustive, once-for-all solution was not achieved, God gave the women a great discussion and tremendous food and fellowship. All of us want to make an impact for God’s Kingdom right where we are, everyday. Have you ever felt, though, that you can’t? Or aren’t? I know I feel like this all the time. We get overwhelmed, feel ordinary, and forget that God is at work. And become isolated. 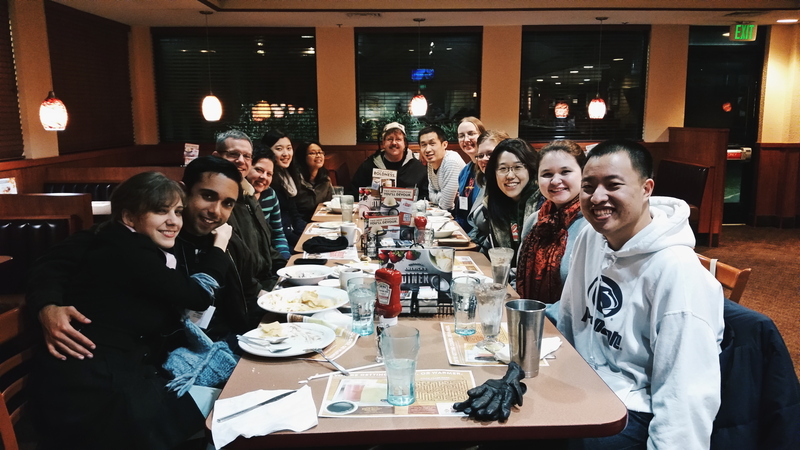 Our Annual Philly Area Denny’s Run at Winter Conference! These are the very things that our healthcare students and professionals are struggling with every day, and why we hold our annual CMDA Northeast Winter Conference. This year, our theme was ‘The Extraordinary Life Of An Ordinary Christian in Healthcare: Lessons & Stories From The Field’. We had a great turnout, with roughly 180 in attendance. (In fact, we had to close registration early). Without a doubt, this was the best Winter Conference I can remember, largely because our speakers were so transparent about their failings, yet pointed us to God’s work in and through them. As we closed the conference on Sunday with a worship service and communion, there was a tremendous sense of God’s presence. 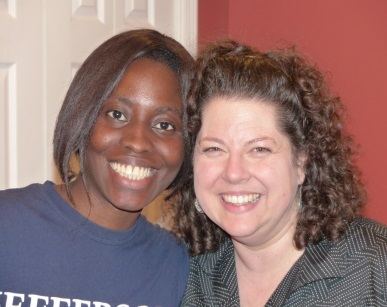 And, best of all, one of our dental students put her faith in Christ for the very first time. Sharon and I were privileged to play a role in planning the conference, helping with logistics there, and, many meaningful conversations with the students. In a way, you – our support team – were there, too. Your support allowed us to represent you and your prayers were the fuel behind everything God did through us. From the bottom of our hearts, we thank you. praise for several fantastic events: our men’s and women’s nights, as well as Winter Conference. Please pray that everyone would apply what God showed them! I (Bryan) give God praise for Sharon. She did so much for the women’s night and especially Winter Conference. Everyone was raving about her work and she frees me up to focus on what I do best. [End of bragging session]. Praise God for a solid December financially. At the same time, our ministry account remains lower than normal at this time of the year, so please pray for me as I will be conducting more personal support appointments. Please pray for these upcoming events – our home bible study brunches (2/7 & 28), focused on the theme of how to discuss faith with your patients, and, a wedding I’m officiating for two of our favorite medical students on Jan. 31st. Finally, pray for our times with our students, the heart of our ministry. We need God to give us wisdom help us help them in their relationship with the Lord, and, impact others. Look carefully then how you walk, not as unwise but as wise, making the best use of the time, because the days are evil. 17 Therefore do not be foolish, but understand what the will of the Lord is. Over recent months, God has challenged us to think about how we can focus on what we do best, and, where we can bring unique value to the students and professionals in our area. With 8 different campuses, we want to have an increasingly clear focus on what matters most! Without a doubt, one way we can ‘mak[e] the best use of the time’ is to invest in our student leaders. Since they impact others in their campus fellowships and experience nearly 100% turnover each year, equipping them is one of our highest priorities. I was glad to come! Thanks for organizing it! I was able to get in some catching-up with [two of the women], and to hear the Temple guys out as they formed their “keys to the game” for the coming year – both very excellent things! Especially that last little bit was helpful and I feel more aware of their priorities for the coming year and also more able to be involved. Throughout the day, we allowed for small group sessions by campus so that the leaders could personalize what we discussed. Afterwards, I emailed some key follow-up questions and will touch base on them as I go around to our campuses. All in all, it was a tremendous time of teaching, fellowship and application. We trust that God will multiply our small investment in the months to come. Thank you, dear friends, for making it possible. 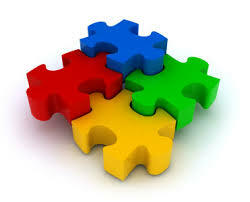 You are an absolutely essential part of our team! Praise God that the students are back! And, that the Campus Leadership Summit went so well. Pray that God helps our leaders apply a few things God impressed upon them, and, that he helps me (Bryan) follow-up faithfully. Praise God for a new (to me) ministry car. So thankful! Please pray for great wisdom as I visit all our campuses as much as possible this first month. I need God’s help in discerning what each campus’s leaders needs are, how I can help, and, which men to start/continue investing in. Pray also that God helps Sharon connect with the women He has in mind. 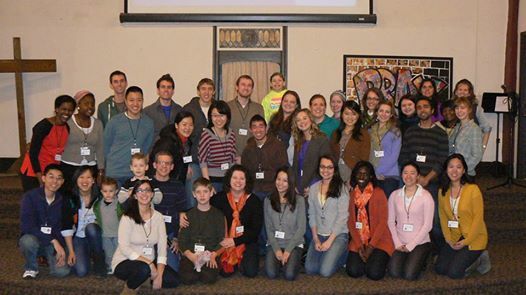 Pray for many first-year students to get involved: they are the future of our campuses and next year’s leaders! Pray for new donors, and, our overall account balance, which is lower at this time. Pray for Intermed (teaching, fellowship, worship for local healthcare students and professionals; domestic missions theme) on Sat. 9/20 from 9a-1:30p at Esperanza’s Hunting Park location. Finally, pray that many students and residents would come out to our Fall Retreat on 10/11-12. We’re praying for 25 to sign up, in addition to several professionals to serve on a panel and connect with those who come. Don’t miss life in the process of taking the perfect picture – just take a few snapshots and move on! This month, we’re going to give you just that – a few snapshots of what God did. We hope you’ll enjoy reading about them as much as we did participating in them! June 12th – met with a ministry leader and friend about supporting a new campus in our area. One of our council members serves as adjunct faculty there, and, there’s a strong faculty adviser already in place, so we’re excited to see how we can help. June 17th – first meeting with a new couple we’re mentoring. Great time getting to know them and their stories. 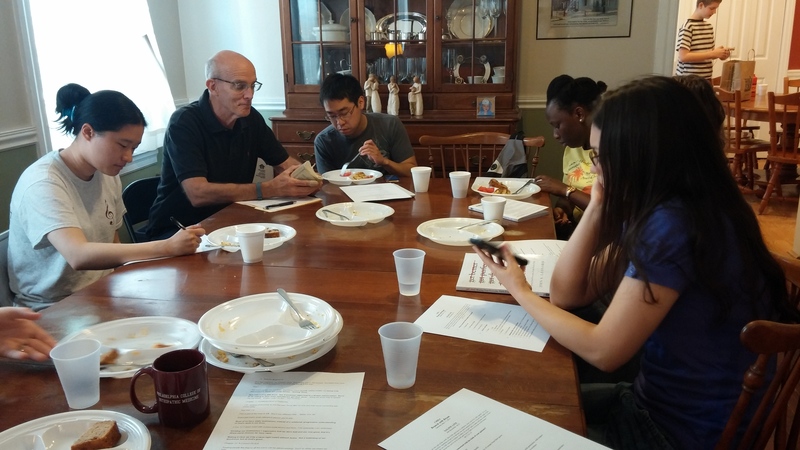 June 18th – nice time of discipleship with one of our campus leaders. In response to the question, ‘What was one key thing God has been teaching you this year?’, he mentioned ‘God has taught me to be quieter and listen more to what others have to say’. Priceless. later that day – reconnected with a physician I hadn’t seen in some time. I appreciated his candor in asking for prayer to overcome cynicism and living for comfort. His request itself is a sign of God’s work. June 21st – spoke with a physician who wants to get involved with PCOM, one of our medical campuses. Her willingness to jump in and see what God will do is exactly what the students need! 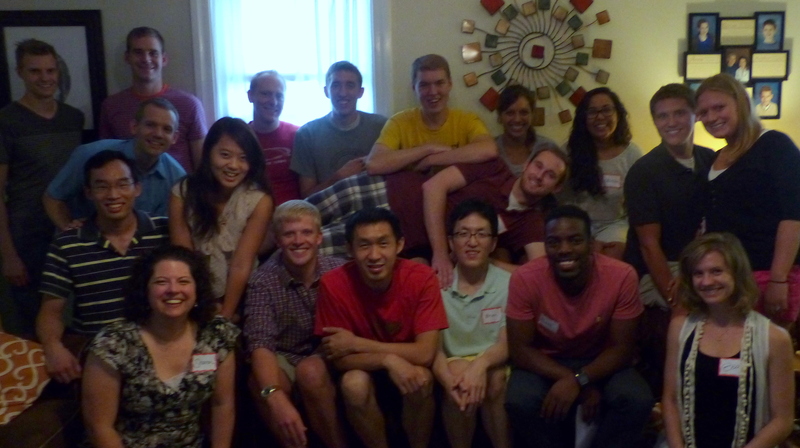 June 22nd – hosted a gathering for students, residents and practicing professionals at our home. God gave a true spirit of openness and vulnerability, with a theme of ‘trusting God when life is hard’ emerging among our professionals. Great for those who are younger to listen in and learn. June 25th – met with a student leader at one of our dental campuses. Met with two of his co-leaders on different days because their schedules are so intense we couldn’t coordinate! We’re working together to see how we can create a community in this environment. later that day – met with a local pastor who’s completed medical school before receiving a call to ministry. Curious to see how God will let us work together! 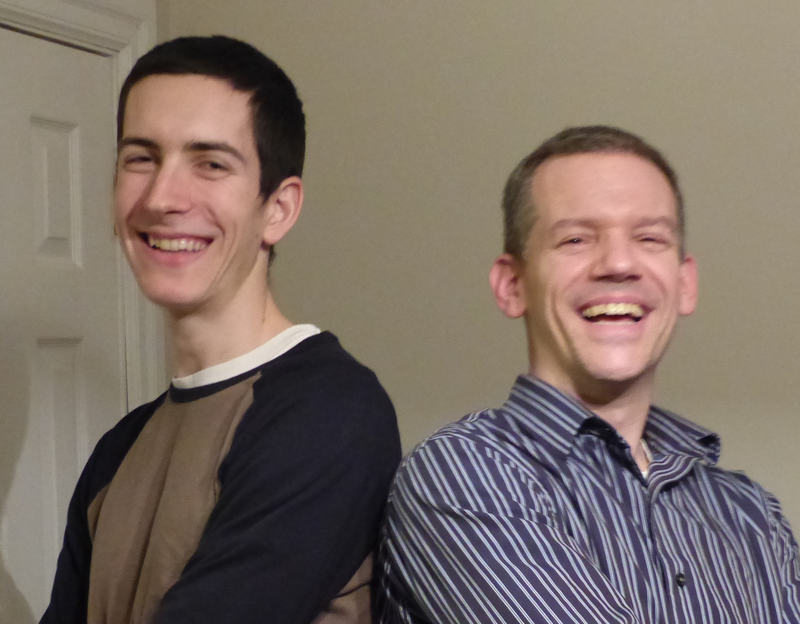 July 2nd – terrific time of discipleship with a student. God used his questions about a relationship and his future calling to lead us into even deeper issues that, more fully explored, will lead to great blessing in his life. 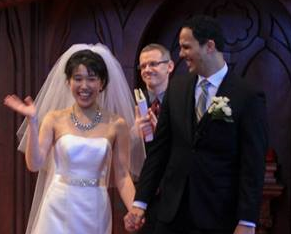 July 4-6th – officiated the wedding of two of our student leaders! 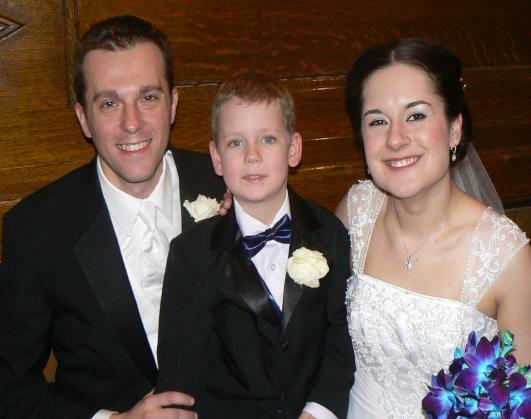 We had done their pre-engagement/marital counseling, so it was a privilege to be there for their special day. We also had the chance to visit two couples from the area who are good friends and supporters of our ministry. So, there you have it… or, some of it, anyway! A lot more happened, but hopefully this gives you a feel for this past month. Thank you, thank you for allowing us to do what we do! praise for a balanced month where we enjoyed time with students, but, as many are away or busy, also with other people who are both friends and essential to the ministry. praise for the privilege to share in the Tim’s & Tiff’s wedding. It was such a great joy to see them officially starting their new life together! praise that God has provided us with a cost-effective, solid car I can use for ministry. Thanks to the many, many people who prayed, networked and contributed to this effort! 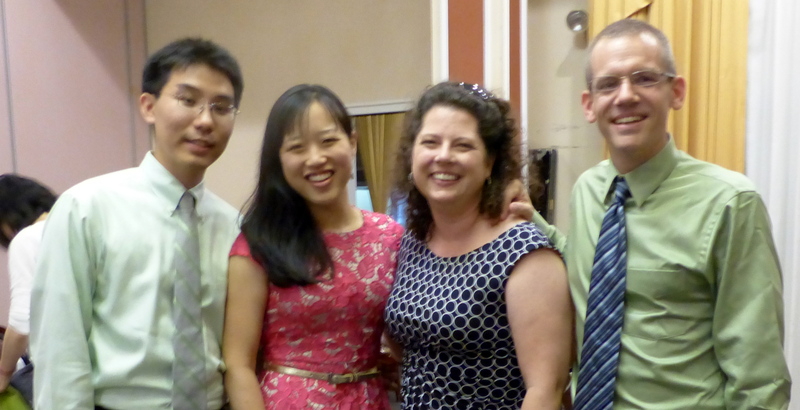 praise for our first-ever picnic for residents and fellows (7/12) and the two local physicians who graciously hosted. Those who came want to meet on a semi-regular basis and stay connected with each other. pray for our support development efforts to yield fruit. pray for our next summer gathering (7/20) and citywide campus leadership training (8/23). pray that our family’s time away at ‘Joni & Friends Camp’ (7/28-8/1) is both restful and a time to grow in what it means to have Matthew as part of our family. Now that June is here, our students are either gone or engrossed with finals or board exams. Thus begins our summer, which will last until the students return in mid-August. Although we miss them tremendously, it is also a special season where God gives us time to strengthen our foundation, the part of our ministry that, although unseen, provides the basis for the more obvious, public parts of our work. In this update, we’d like to let you in on part of that foundational work. Without a doubt, the volunteer healthcare professionals that help us in our work are a critical part of our ‘foundation’. Some serve on our ‘council’ in an official capacity where they play various roles – working with students, spear-heading new ministry efforts, and/or, helping me think through issues and vision on a more strategic level. 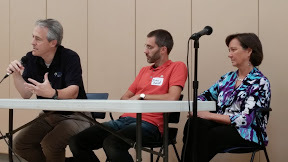 Over the summer, I check in with our council to see how they feel about the role they’re playing, and, how we might work together to put them in a place where their gifts, time and talents may serve the Kingdom best in the context of our ministry. One of those new offerings is our ministry to residents, those who have graduated from medical school but still have (approximately) 3-7 years of further training before becoming full-fledged physicians. Working roughly 80 hours per week, they are busy, but need to continue connecting with God and other Christians so that, at the end of their training, they will be in a position to serve their patients and colleagues. (And, simply be in a healthy place themselves). To that end, I’m thankful for Drs Alex & Kim Lin, who have agreed to take the lead with this. We’re busy identifying residents in the area and will then invite them to a ‘welcome picnic’ on July 12th, where they’ll have the chance to meet others in their situation and hospital for future connection. In addition, we’ve been asking them what would serve them best given their unique situations. No doubt there will be lots of trial, error and adjustment along the way, but we’re excited we can take steps to support them in this critical time! This past year has been one of tremendous blessing, but it takes an increasing amount of resources as our vision grows. Sharon, for example, has been serving as our part-time administrative and ministry assistant (focusing on our women) for roughly 9 months now. She has been such a blessing to our work that it would be hard to overstate her impact. At the same time, her salary, in addition to normal donor attrition, has led to the need to increase our support base. So, over the summer, we plan on asking you, our current supporters, for the names of a few others who might want to hear about our work. It’s also a fantastic opportunity to catch up and hear how we can be in prayer for you and your family! Well, there you have it. A short, but representative, look at the unglamorous yet essential work on the foundation we tend to during the summer. The truth is that you, through your quiet prayers and gifts, are also an important part of that foundation yourselves. Without you, the whole house would crumble in a second! But with you, each day God is adding to it in ways that only He can fully comprehend. praise God for the conclusion of another year of phenomenal student ministry at our 8 campuses. Many, many signs of God’s work in and through our students! praise God for the blessing Sharon has been to our work as her role has expanded. please pray for the informal summer gatherings on 6/22 & 7/20 at our home. pray that God helps us to identify our Christian residents (they can be difficult to find due to busyness and isolation), that they can attend our welcome picnic on 7/12, and, that we can figure out how to best serve them throughout the year. pray that God connects us with new individuals and churches who will support God’s work through us. The look of stress on the faces I pass says it (without words) all. This last month before classes end, and ‘boards’ begin, is a trying time for most of our students. Things have a way of piling up at the end of the semester, and (understandably) everyone tends to be a little more distracted and a little less available. So, every May, we adjust our strategy. Our meetings with students are less frequent and shorter. We check in more through emails and texts: ‘How’s it going? How can we pray for you?’ And, with new leaders onboard, I work hard to set up meetings with them to strategize for the coming year, address any areas of concern, and help them establish their key priorities. To give you a feel for how it works, I had an especially good meeting with the leaders from one of our dental campuses. They’ve been extremely committed in re-launching the group during their first two years, but, understand their commitment next year will be more sporadic because of clinic, which involves seeing patients. In addition, we will only have 1 leader next year who won’t be in clinic, but he has some other factors that may make it harder for him to ‘run point’ and lead the club. All of this can feel overwhelming, and, make it challenging to continue the group’s recent success. This is why I’m here! seek the support of the professor who’s been coming – although faculty can’t come frequently, their example of following Christ in the academy is irreplaceable. It sounds simple – almost too simple, right? It’s certainly true that this would not qualify as ‘rocket science’, but in the midst of schedules with precious little time, I feel privileged to help the students stay encouraged and take the small steps that will help them obtain God’s vision for their group. Each campus leadership team’s needs are different, but real nonetheless. 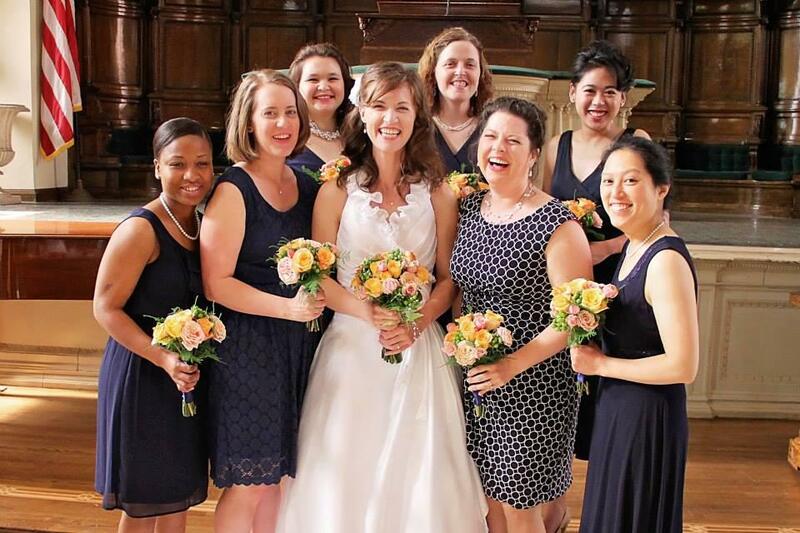 As leaders stay focused on the Lord and His vision for their group, their fellowships thrive. Thank you for making it possible for Sharon & I to support our leaders; together, we’re making a difference. Praise for great leadership teams at our area campuses and the opportunity to speak into their lives. Please pray that God gives all of us wisdom to discern His vision for each, and, the strength to live it out. Pray that God gives the students strength to finish well academically, and, to keep growing in their love for Him. Pray for our ministry team as we start to minister to medical residents (the stage in training just after medical school, but before becoming a full-fledged physician). Finally, please pray that the Lord provides a reliable, cost-effective car for me as mine is, as they say, near the end of the road. Just wanted to provide a short update on all that God did at our Community Life & Relationships Seminar this past Saturday. God answered your prayers in bringing out 32 people to learn more about what it means to live in community and approach relationships from a biblical perspective. I opened our time together with a biblical framework and overview on relationships, then Liz Mosebrook (a counselor) did a great job helping us ‘diagnose’ the common relational challenges we struggle with, and, providing specific help in moving forward. Especially helpful was a time of personal reflection where we had the opportunity to consider where we struggle in particular, and, set specific goals for progress. Later, one student mentioned that God had shown her that, while she was willing to put herself in risky situations physically, she has been less willing to do that on a relational level. Seeing this disconnect in her life was very helpful and will be a blessing in moving forward. After a fantastic lunch, we ended the day with two seminars, one on dating and relationships (Sharon & I), and one on life in community (Nurse Practitioner Deborah Moss). These were rich times of teaching and personal interaction. On a related note, Deborah has been casting vision for forming intentional community among healthcare students, and several have expressed a desire to possibly live together in North Philadelphia beginning in the summer or fall. Among other things, it’s our hope that these students would both gain a heart for using healthcare to serve the underserved, and, be blessed by all that these communities have to offer. Stay tuned as God unfolds this story! As you can see, God blessed our time together. Thanks again for your prayers! Please pray for our Community Life & Relationships Seminar tomorrow (Saturday) morning from 9am-12pm, with optional seminars running afterwards until 2pm. We’ll be thinking about God’s vision for relationships, the obstacles we encounter in them, and, how we can practically grow in this area. work in our lives long after the seminar ends; we are asking God to use this event as a springboard toward lasting change that honors him and blesses many others through those who attend.